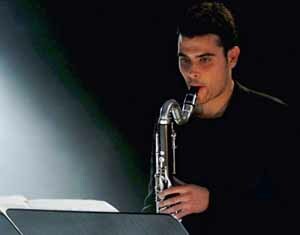 Originally from Valencia, Spain, after clarinet studies at Madrid’s Conservatorium, Carlos relocated to the Netherlands in 1995 in order to continue his musical education with Harry Sparnaay at the Conservatorium van Amsterdam, obtaining a Bachelor Degree and a Second Phase Degree in Bass Clarinet. Founding member of Insomnio Ensemble and the N Collective, he collaborates with Klangforum Wien, Ictus Ensemble, ASKO Ensemble, Nieuw Ensemble, MusikFabrik and Radio Kamer Filharmonie with whom he has recorded for Unsounds, NMC, FMP, Cpo, Kairos, Teldec and Ox-R. He has performed at many international festivals in Europe, Africa, Asia and America. Carlos has been soloist with the Nieuw Ensemble, Klangforum Wien and Insomnio Ensemble. In 2000, after several working sessions with Pierre Boulez, Carlos Gálvez performed for the first time the version for bass clarinet and live electronics of "Dialogue de l'ombre double". During 2004-05 he was invited by the Nieuw Ensemble to premiere “Shadowtime”, first Brian Ferneyhough’s Opera, which was released on NMC Records.